The Redstone Mill was constructed as a Nickel Concentrator in 2006/2007 to specifically handle up to 2,000 tonnes per day of altered komatiite ore. Redstone is the only mill in the Shaw Dome Nickel Belt area. Northern Sun will operate the mill on a toll mining basis in 2014-2015. The mill currently operates as a 1,500 tpd concentrator however the circuit can be split to provide two independent circuits, each of 750 tpd. This flexibility will be beneficial for toll treatment of a variety of ore types identified in the Timmin's region. The concentrator consists of two buildings, namely the crusher house and the mill building. At the crusher house ore falls through a grizzly into a coarse ore bin with a capacity of approximately 100 live tonnes. The 24” minus material is conveyed by a 42”X16’ Simplicity pan feeder to a 30”X42” Birdsboro Jaw Crusher that crushes the ore to 3½ ” to 4” minus. The crushed material is then conveyed to the Gator Double Deck vibrating screen which feeds the oversized material on a conveyor equipped with a self-cleaning magnet for tramp steel removal, over to the Metso HP 400 cone crusher. The HP 400 is a safe, modern and dependable cone crusher and is readily available in today’s market. 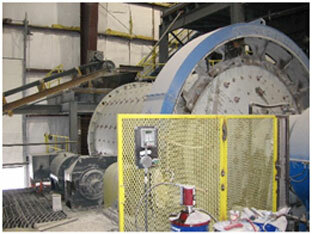 The crushing plant is fully automated with VFD (Variable Frequency Drives) for operational flexibility. All equipment can be energized from a PLC in a control booth. To ensure the health and safety of the operator, any airborne dust particulate is collected by a KTM AA 19/30 dust collector system. The crushed ore at 5/8" minus is conveyed from the crusher house to two fine ore bins located in the mill building through a conveyor galley way. Conveyors underneath the 800 mt fine ore bins feed the grinding circuit which consists of two Dominion Engineering 10’x13’ and one 10.5’x13’ ball mill. The ore can feed one or two primary ball mills as the three ball mills can work either in series as a primary, secondary and tertiary grind or as two primary mills for a secondary grind. This flexibility allows two different types of feed (low grade and high grade or custom ore) to be processed at the same time. 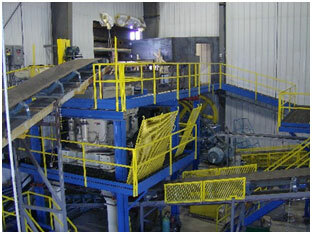 Cyclones work in conjunction with the ball mills to achieve the grinds required for flotation. The finely ground ore passes from the cyclone overflow into conditioning prior to the rougher flotation tank cells. Chemicals are added for conditioning purposes prior to the rougher cells. Cleaning of the sulphides is achieved by scavenger and cleaner cells with appropriate chemical and mechanical action. 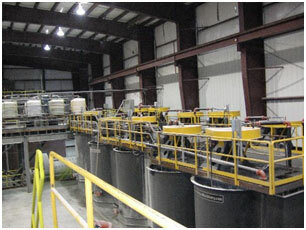 The flotation concentrate and tailings are then pumped to two different thickeners in the mill building. A 40' dia. high density cone tails thickener removes a large amount of water from the tailings leaving a "tooth-paste-like" material consisting of about 25% solids which is pumped into the tailings area. 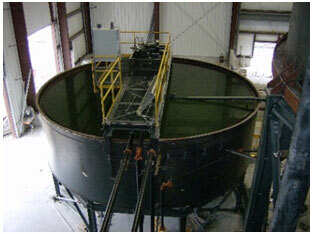 The concentrate is pumped to a 26' diameter conventional concentrate thickener which also removes water from the slurry. The thickened concentrate is then pumped into a surge tank feeding the Larox Press Filter which produces a concentrate of 9% moisture. The concentrate is then conveyed into a concentrate holding bay. The concentrate is weighed and sampled upon shipping. The moisture content and payable metal grade of each shipment is then determined at Northern Sun's laboratory in the mill building.